Election coverage, natural disasters, and Wall Street meltdown got you down? Let’s go back to a simpler time — 1984! It’s morning in America again, and the dawn of a new information age. With an Apple II, a Kaypro 2, cheeseball computer animation and a grab-bag of corny jokes, this is classic computing from the VHS era. Keep an eye out for references to Wargames, hackers, Boy George, Ronald Reagan, and more. I’ve highlighted the different sections and my own highlights in the video’s comments, but feel free to add your own on Viddler. Special thanks go to Dave Cassel from 10 Zen Monkeys for finding and loaning the VHS tape to me. Thanks to Colin Devroe at Viddler for the support for their brilliant service. I’m Sammy Reed, the host of the online program, “Music from the World of the Strange and the Bizarre”, where the audio from the album comes from (episodes 12 & 13, in case you give a darn). I started playing with computers with the Timex Sinclair 1000 that Hills Dept. Store had on display in 1982. It was soon replaced by the TI/99. I got a Commodore 64 for my birthday in 1985, and made a few “programs” on casette tape just to fiddle around. I was no “whiz” by any means. Those were the days, when we didn’t have a “caps lock” button – we didn’t know how to make SMALL letters with these things. If you’ll excuse me now, I’m gonna see if you could get any of those old tape-club program casettes on E-Bay. I recall reading a PC book back in the day (probably not Norton, but you never know) which when defining modem, somehow managed to work in the phrase “How many mo’ dem do you want? It’s not quite Sorting out Sorting, but it’ll do. Here’s something I did awhile ago, using samples from the LP. …using my copy of the vinyl LP — found in a thrift store for $1, of course. Thanks so much for posting this. Very clear recording. I just missed picking the album up on eBay recently. Back in the early eighties we used what was called a BBS or Bulletin Board System to communicate through the modem before the internet hit it big. 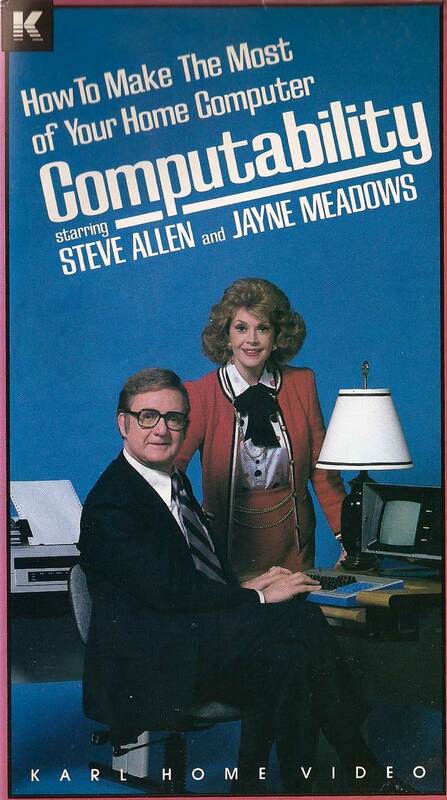 It amazing that Steve Allen and Jane Meadows are unknown to most people today. A very intelligent married couple, they were prolific authors and instrumental in early media experimentation going back to pre-television. Check out his interview with a young Frank Zappa for instance. And guess were the late night hosted television shows format came from? 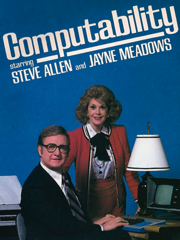 Steve and Jane tried to raise the ‘smarts’ of the baby boomers and increase the knowledge of future generations through several television series and specials. It is unfortunate that they failed. added! ! I like your blog! I can’t thank you enough for putting this album here that I had – especially since I don’t have it anymore. I tell the whole sordid story of “the purge of 2012” on my new “Music from the World of the Strange and the Bizarre” blog! I currently don’t have my online show, or my website, but my new blog will have out-there stuff. In my latest post, I linked to this page – one of the web pages that have something I used to have. I’m glad that at least the album is able to be downloaded.